Any parent who has ever taught a child to ride a bike has undoubtedly had a few moments of panic as the child starts wobbling out of control. Even more terrifying is seeing your kid careening toward an intersection, apparently unable to stop himself. A group of inventors has come up with a unique way to make parents feel more secure: a remote control bike brake. The MiniBrake fits onto the bike’s frame just above the rear tire. Its remote control has a range of 50 meters (a little over 160 feet) so you (appropriately) need to stay close to your child while he’s out learning to ride. If you see your little one about to run into a dangerous situation, you only have to push the remote control’s button and the MiniBrake clamps down on the rear wheel. This might sound even more dangerous than letting your kid ride a bike on his own – we at first had visions of kids being stopped suddenly and immediately flying off of their bikes – but the stopping motion is actually a bit gentler than that. The stopping occurs over a distance of 20 inches, giving the rider enough time to realize that the bike is coming to a stop and prepare to put his feet down so he doesn’t fall over. The MiniBrake’s battery is long-lasting and smart enough to shut itself off when the bike is not moving. LEDs on the device indicate the level of the MiniBrake battery’s charge. 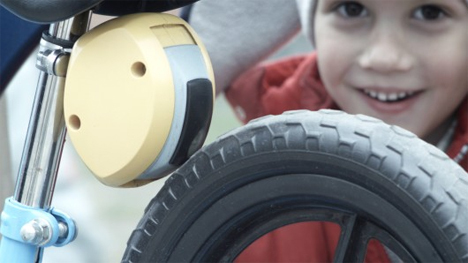 If the child rides out of range or if the MiniBrake detects that the bike is broken or has a flat tire, it automatically puts on the brake. It’s an unconventional training tool, but in combination with helmets and protective pads it could conceivably prevent plenty of children’s serious bike accidents.